Account based marketing (ABM) uses highly-targeted content to nurture your ideal audience. It focuses on the committee of buyers or individuals within your target accounts. Rather than marketing content to everyone, you use ABM to target your top prospects with relevant messaging and content. However, this is only one side of a successful ABM plan. The other side of a strong ABM plan involves social selling. Social selling is using your social network to find and nurture relationships with the right prospects, building trust through engagement, and ultimately paving the way for your prospect to become a customer. In social selling, you use insights from social media to engage and to share relevant content with prospective customers. LinkedIn Campaign Manager and LinkedIn Sales Navigator are well positioned to help marketing and sales teams engage top prospects for ABM. Marketers can reach buying committees with relevant and targeted content. Sales teams can identify decision-makers with lead recommendations to uncover influencers at target accounts. Here’s a quick start guide on the basics to get rolling with ABM and social selling on LinkedIn. Walk before you run. To begin with, marketing and sales leaders will need to define a strategy, agree on common goals and communicate the plan to the organization. Your organization's sales reps should know who the buyers are, and how their function connects into the decision process. This includes agreeing on promising accounts to pursue, desired outcomes, responsibilities and performance measurement. Align with sales on overall strategy with a focus on both top and growth account opportunities. In terms of responsibilities for ABM, we are seeing a paradigm shift away from what is traditionally expected in an inbound marketing plan where marketing hands off only the most qualified leads to sales. Instead, what we are seeing is marketing is looking for sales to move up the funnel by leveraging their social presence to drive brand awareness and education as well as offer more sophisticated solution and relationship selling. Sales is encouraging marketing to move down the funnel engaging prospects throughout the sales cycle. Working together across the buyer journey, marketing and sales are improving close rates and sales cycle times. 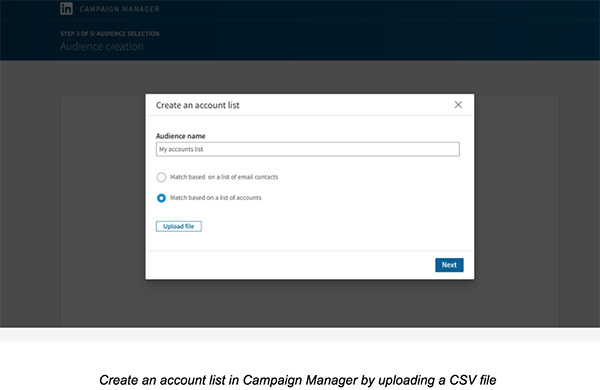 Once you agree on your account list, it is simple to get started with your ABM plan in LinkedIn Campaign Manager. See this quick-start guide to account targeting to get started. Create an account list you’d like to engage on LinkedIn. Our platform cross-references this list against the more than 8 million Company Pages in the LinkedIn ecosystem and creates an account target segment based on this match. You can then layer on additional profile information to hone targeting such as, seniority or job function to get your content in front of the buying committee. 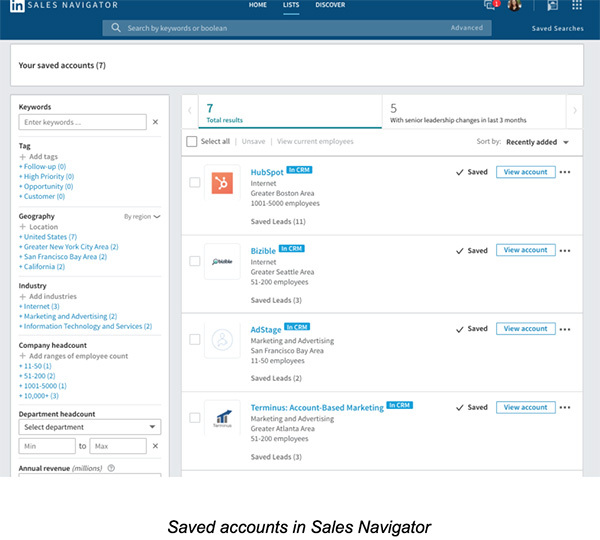 To kick off social selling on Sales Navigator, LinkedIn will suggest accounts during the initial set-up process. However, you may also search for new accounts. When you find an account you want to invest in, select the company name. You’ll be able to review content within from the account, such as social shares from company contacts. LinkedIn gives you a hand showing you your active leads and additional lead recommendations. Connect with your sales team to document social selling insights about your target buying committee. What kind of content is required? How should it be delivered? With this information, develop engaging content that connects with value to each person on the committee. This requires a clear series of value propositions showing that you understand the account’s biggest challenges and goals delivered via a variety of messages and content. How do you make the purchase process easier for buyers? Focus on the obstacles they deal with along the buyer’s journey. Break barriers by mapping the customer journey and design prescriptive recommendations to overcome challenges. Top B2B marketers are prescriptive, offering recommendations for action backed by a clear rationale; and they explain complex aspects of the purchase process clearly. Also, invest in thought leadership for ABM. Research by Edelman & LinkedIn found that most marketers undervalue thought leadership. When surveyed, only about 17 percent of B2B marketers believed their thought leadership gets their company on more RFPs from potential buyers. But when you ask buyers, that number jumps to 41%. There’s an opportunity to earn decision maker trust with a more meaningful investment in thought leadership. Not all touchpoints are created equal. The Edelman Trust Barometer says on any given topic, buyers trust people like themselves like subject-matter experts and their peers. They prefer people like themselves over brands and corporate entities. With this in mind, LinkedIn provides opportunities for you to engage prospects using information gleaned from their social media activities. Sales Navigator enables you to share helpful resources to show up as a problem solver and strengthen personal connections. If you find a great blog post, ebook or video to support your prospect, share it and tag them. Go where your connections are and engage in thoughtful discussion. Leave constructive comments on content they share on LinkedIn. 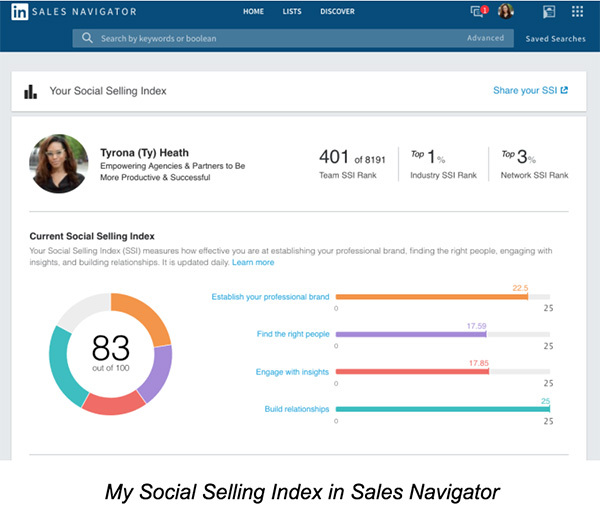 Sales Navigator offers a Social Selling Index (SSI) to help you benchmark for your social selling investment. As you grow your ABM efforts, tracking your progress will connect you to the impact of your program on pipeline and revenue. Leadbuilder is Sales Navigator’s prospect suggestion tool. It uses current account profiles, information on the Web, and criteria that you select to find the most active leads. Lead Recommendations can help uncover decision-makers and influencers at your target accounts. Tap into your team’s network. TeamLink identifies how members of your team could connect you with a lead or account. Overall, by staying on top of ABM leads and leveraging your organization’s network, you can identify buyer triggers based on engagement and social activities and respond accordingly. LinkedIn members who have been nurtured by a company’s marketing campaigns are 11% more likely to accept a connection request from that company. LinkedIn members exposed to a company’s marketing on the platform are 25% more likely to respond to an InMail from one of that company’s salespeople. If the prospect is exposed to thought leadership, to content marketing, there is a 150% lift, and the response rate jumps to 40%, and that’s about 14 times higher than the kind of response rates you see in email. Set the Right Scope for Your ABM Campaign — Having more companies and larger companies on your list allow for more scale. With limited scope, you may struggle to earn clicks and conversions. If you are not seeing enough engagement, consider layering on demographics and/or refining your creative to get in front of the right people. Get Creative About Targeting — Think creatively about targeting your ABM program on LinkedIn. For instance, target customers to show them product updates or cross-sell opportunities, exclude competitors by adding them to a list and think beyond “prospects” to churned accounts and upsell accounts. Use Assets Across the Buyer Journey — Make sure you are putting assets across the buyer’s journey in front of your prospects. Prospects may be hearing about the company for the first time or they may already be in conversations with your sales team. Keep a 3:1 ratio of gated vs. ungated content. Think About Measurement — with help from your sales organization. What does success mean for your account list? Make sure that you allow an adequate test period to evaluate program performance. 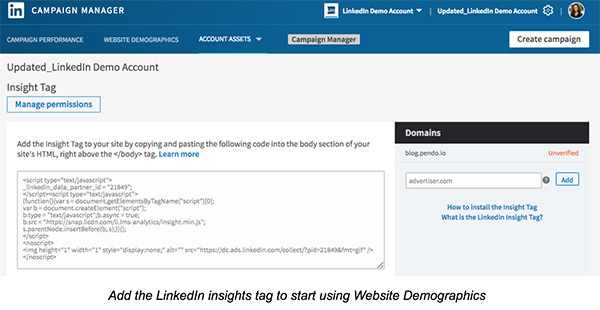 Use LinkedIn Website Demographics — to develop and refine your account targeting. You can see the top 25 companies that responded to your content. This may show intent to buy. With sales and marketing alignment, prescriptive thought leadership content, social insights and the right engagement, sales and marketing are transforming how business is won together. 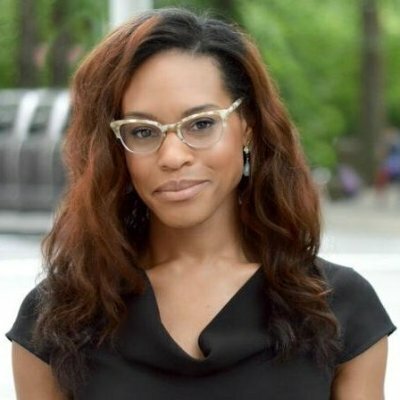 To succeed at ABM, your organization will need to embrace what you already know about relationships and make moves to align sales and marketing. Social selling is an important complement to ABM. Both strategies require engaging prospects with relevant content. After all, relationships matter! To learn more on social selling, check out this How to Guide for Social Selling. And to dive deep into ABM, download this Crash Course to Account Based Marketing on LinkedIn.